When hosting a corporate event, we know it’s important to get everything right down to the last detail in order to give your guests the best possible impression of you as a potential business client. That’s why our professional team at Hog Roast Rubery are called upon time and time again; to ensure that your corporate event is a reflection on you and the high standards you set for your business. In the recent weeks, we were called upon by Jonathan, the owner of a hardware store looking to expand his business and attract potential investors. He wanted to feed his guests in the lunch hour of his corporate day but needed to do so quickly and easily, so he could keep people close to the facility and would able to crack on after lunch. Though he wanted simplicity, he still needed the food to be hot and fresh, and the service to be smooth and friendly, and so he chose option 2 of our Corporate Hospitality Menus: a choice of slow roasted meat and a freshly prepared salad as well as warm new potatoes served in herb butter. Our marvellous team at Hog Roast Rubery were on site hours before the guests arrived and had the meat roasting – a succulent joint of lamb. A separate serving table was also prepared for the sides, bread rolls and selection of sauces. When lunch time came, the lamb was piping hot on the inside and the skin was crispy on the outside. Our wonderful chef served everyone with a smile and a friendly chat in a quick and efficient manner, ensuring everybody was fed quickly and felt looked after by our team. At the end of the day, when we had cleaned up after ourselves, Jonathan thanked us for providing a service that was a reflection on his own, and he felt confident that he had secured some new business. 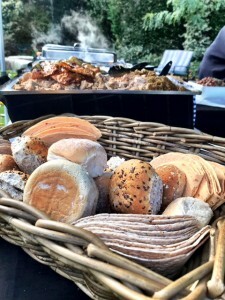 If you ever find yourself the host of an important corporate event, then the team at Hog Roast Rubery are here to provide your guests with hot, fresh, tasty food and service that will match your own. Christmas Party Preparation – Hog Roast Sparkhill!